It normally takes between 3 and 4 years for the Paphiopedilum to produce its single exotic flower, but this Lady's Slipper is clearly worth waiting for. Dramatic maroon markings dance across petals that fade from green to white. Handsomely dappled leaves provide a lush base for this long-necked beauty. 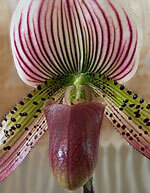 If you're looking for a rare and decadent gift, this Paphiopedilum is an exquisite choice. 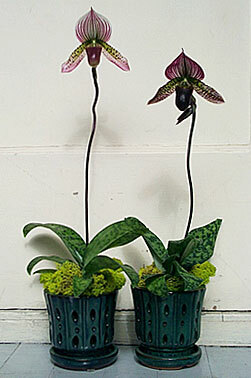 A single stem-potted slipper orchid can be placed anywhere in your home or office. With proper care, the bloom will last between 1-2 months. This rare hybrid is perfectly displayed in a beautifully crafted japanese style glazed pot, as shown in the picture. 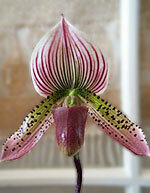 From base line to top petals, the orchid stands at approximately 14-16 inches tall. A single bloom measures 3.5 inches in length.